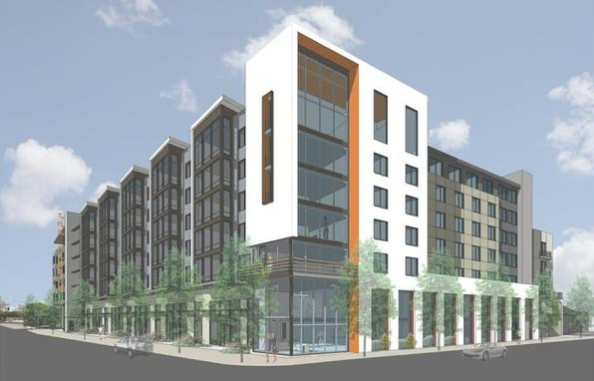 If One South, Centerra, the two KT Properties towers in San Pedro Square, and the Pierce weren't enough, there is yet another residential project happening Downtown. SiliconSage Builders is turning an aging used-car lot behind the San Jose Convention Center into 100 for-sale homes. They designed this project to match the surrounding Craftsman-style homes, but I have to say that the design looks antiquated even before a single shovel hits the ground. For example, have a look at the very bottom at what The Pierce in SoFA is going to look like. That building is going to be just a couple blocks away as is 360 Residences. When you try to match everything in the neighborhood, things start looking pretty homogeneous and generic. We should be trying to set the bar higher and not worrying about things looking out of place. The buildings that stand out are usually the ones that bring new character to a community. I'm happy to get more people Downtown and extra foot-traffic in SoFA, but I think this project could have been much more dense and look a heck of a lot better than what is planned. What do you guys think? Looks kind of bland. The inset balconies make it look like a bunch of caves. Balconies should be outside. Otherwise they are dark and end up used as storage. "Yay, more stucco." -said no one, ever. I agree not the most attractive looking place but it's on a residential side street. Redesign!! Also will there be retail? I don't mind craftsman style, but they could do a better job then what's been rendered. Why don't they make it slim and taller, about 14 story tall? If they go taller than 6 stories, they would need to add more units (it's already at 67 units/acre) and would have to switch to steel/concrete construction ($$$$). The top design could not be more boring. 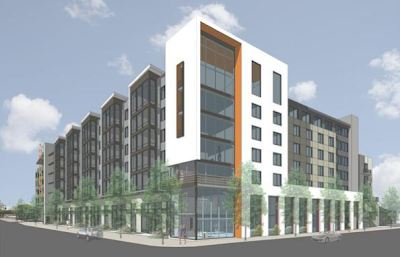 I don't understand why builders in the South Bay are afraid of more modern design (like the rendering of the Pierce building). I agree about some of other negative comments of dull nouveau Craftsman, stucco, and cave-like balconies. Why does all the interesting new architecture happen in our libraries or up in SF and the East Bay??? People down here like modern too!!! Everyone needs to go to the community meetings for this project and complain about the design. It worked for the Hampton Inn. I wouldn't confuse the city with one misguided developer. Yeah, close your eyes to all the good that's happened to DSJ over the past two years and make a blanket remark over this one project. Very San Jose Inside-ish of you.. I agree as to no vision. It's as if any developer can build any lame project and the city rolls over and takes it. It's really lame and that's why there's such a lack of attention to design by the developers. They just recently submitted the project. It now has to go through the planning commission, architectural review committee, and community meetings, etc. You guys complain abou the city accepting projects, but dont get involved in the process. Go to the ARC meeting, go to the Community meetings where you can voice your opinion in person and not just sit behind a computer and complain. There's an architectural review committee? That's laughable really. They must really bring some expert skills to the process. Ha. What's laughable is the lack of knowledge of the community in regards to how projects get developed and go through the city approvals process. Almost all of this information is easily accessible online. Yeah, it's great to have new developments downtown, but I agree that they could have gone with a more modern/slick-looking design. Hi Adam! Would you be willing to share your design?